This is a nice medieval bronze armorial seal, dating to the 13th - 14th century. It would have once belonged to a knight, bearing his arms. The armorial displays as 'Two lions passant' being without any visible tinctures make it hard to be more precise. The seal is inscribed with the owner's name in a form of 'Lombardic' script, this reads to me as "S'IONIS.DE.MESAIGO?'. 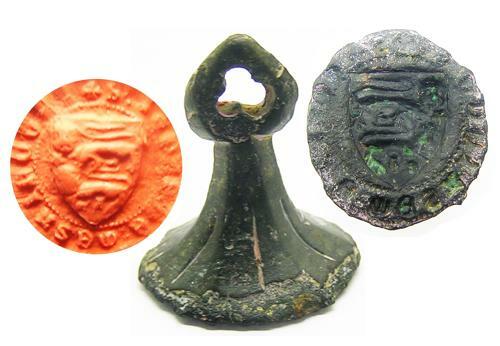 The seal is of a 'chessman' type with a quatrefoil handle. These were extremely important objects to their owners, seldom misplaced or lost as credit cards are kept today. On the death of the owner, their seals were broken up and destroyed. This example is clearly intact and in perfect condition. Similar armorial seals have been recorded from Cambridge (SF-43A30C) and Northampton (IHS-0BB4C1). PROVENANCE: Ex. private collection, Reims. France.